In her first book, award-winning journalist Melissa del Bosque investigates how two FBI agents work to take down members of a drug cartel wrapped up with quarter horse racing in Texas. ...Melissa del Bosque’s fast-paced true-crime tale about a Mexican drug cartel and the Texas cops who chase it... Bloodlines is the story of Lawson’s big shot at dismantling a drug cartel: in this case, the Zetas, a brutal crew of Mexican commandos... What saves Bloodlines from devolving into the gratuitous gore that fills the pages of Mexico’s blood-soaked tabloid media — the so-called Red Notes, or notas rojas — is the unique, binational crime that Lawson is investigating: a colorful money-laundering operation... An investigative reporter who has covered the border for publications like Time and The Guardian for nearly two decades, del Bosque based her account on scores of personal interviews and reams of court documents, and proves herself fluent in detailing the exceedingly different, but equally rich, milieus of cartel kingpins, Texas equestrians and federal investigators ...does provide a penetrating glimpse of borderland culture set within the context of a briskly moving police procedural ...an array of unusual and interesting characters. ...absorbing true story of how a Mexican drug lord became a major player in American quarter horse racing ... In Bloodlines, the author gives us both the engrossing drama of a police procedural — from seeming dead ends to panic-stricken emergencies — and a scrupulous journalistic account of a significant episode in the drug wars. The personal crises that her protagonists endure during their investigation enhance the reader’s involvement in the narrative, but, Ms. del Bosque says, she never took the liberty of inventing dialogue. 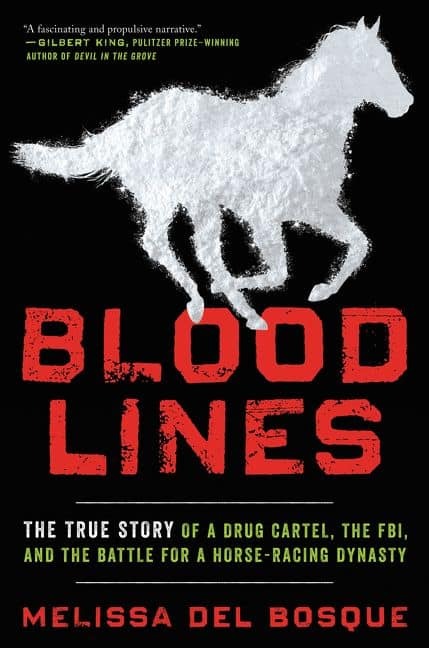 In Bloodlines, Melissa del Bosque tracks a sprawling web of cocaine and quarter horses spanning the Rio Grande ... Operating in between are the book’s true subjects: the law enforcement officers, criminal operators, and citizens of the Texas/Mexico border ... Set from 2009 to 2013 during the rise of the Zeta cartel, Bloodlines details the FBI’s investigation into Zetas boss Miguel Treviño’s horse racing empire ... By virtue of keeping her reporting clean and concise, del Bosque easily steers readers through Treviño’s international financial crimes spiked with brutality — the kind that would make Michael Lewis’ usual suspects blush ...she [del Bosque] brings a slice of the abstracted drug war into heart-rending focus, turning the bloody diamond before her loupe so that each facet becomes clear ... As the eyetooth-flashing nationalists come blinking into the light, del Bosque’s book is a reminder of what many of the immigrants who fled Mexico and Central America have faced. They are refugees from a war they did not start, victims of an appetite that is not their own. What did you think of Bloodlines: The True Story of a Drug Cartel, the FBI, and the Battle for a Horse-Racing Dynasty?